When I was in grade school, the school library had special summer hours for students to check out books over the long summer break. This was wonderful for me because the school was only three blocks from my house, while the city library was over three miles and many busy intersections away. When the kids were little, we always participated in the local library’s summer reading club. They had weekly story time for the little ones who weren’t reading yet, and then different age levels and prizes for the older kids. We went to the library every week, and after we got home, we would all sit down at the dining table with our books, so I could write down all the titles each of us had checked out. We then posted it on the fridge, so that the following week, we would know how many and which books we needed to search for so we wouldn’t have to pay past-due fines. I knew our local Oldsmar library had a summer reading club, but it wasn’t until a couple of weeks ago that I realized it included an Adult level! I got to be in the Summer Reading Club again!! Yesterday, I got a phone call. 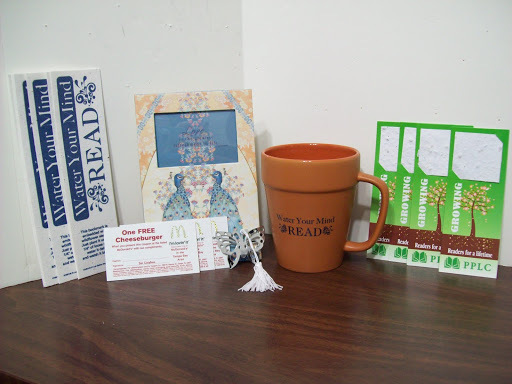 I had won a weekly prize in the Summer Reading Club! Wooohoooo! As you can see by the photo above, there is a substantial amount of loot here: a coffee mug with the Reading Club theme on it, several book marks, all of which contain flower seeds that will grow when you plant the bookmark in your flowerbed; a very pretty peacock picture frame, and a little gold butterfly bookmark that doesn’t get planted in the ground. Oh! And coupons for McDonald’s cheeseburgers.